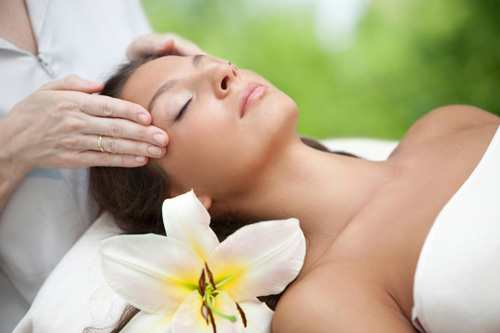 Thai Massage is a beneficial form of massage therapy which everyone should try at least once in their lifetime. Traditional Thai Massage dates back thousands of years for good reason! Our signature Deep Tissue Thai Oil Massage with pressure point technique and gentle stretching. 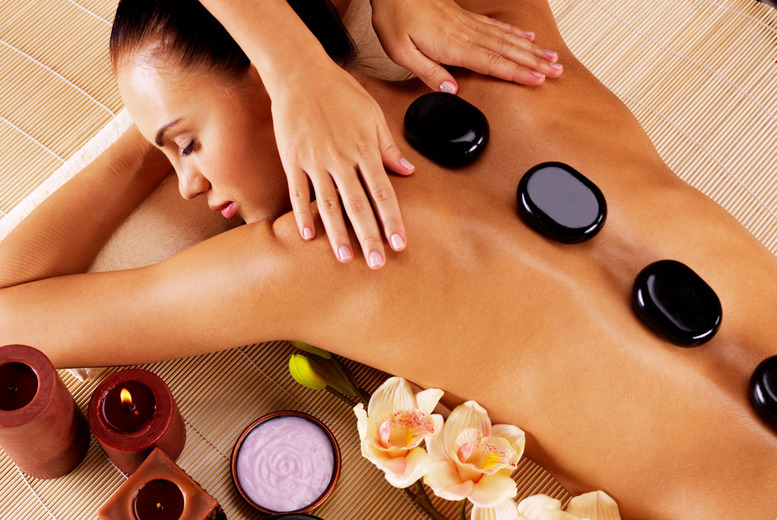 This type of massage focused on the deeper layers of muscle tissue and specific areas. It is designed to reach the deeper sections of individual muscles. Deep tissue & long strokes technique is used to loosen the muscles. It helps to release toxins from the muscles and promote good blood and oxygen circulation. It is both corrective and therapeutic. It is beneficial for sports injuries and chronic pain. It is common for receivers of deep tissue massage to have their pain replaced with a new muscle ache for a day or two. by Siam Balance is generally referred to as classic massage, one of the primary goals of the Swedish massage technique is to relax the entire body. This is accomplished by rubbing the muscles with long gliding strokes and soft to medium pressure in the direction of blood returning to the heart. But Swedish massage therapy goes beyond relaxation. Swedish massage is exceptionally beneficial for increasing the level of oxygen in the blood, decreasing muscle toxins, improving circulation and flexibility while easing tension. The smooth basalt stones are carefully applied to key points on the body. The stones are coated in aroma oils to increase your sense of relaxation and calm. The combination of massage and relaxing warmth is thought to encourage the body to detox and heal, increasing lymph flow and helping to flush out waste. The body becomes relaxed in a much shorter space of time, and the therapist can focus on a deep working of the tissues using both stone and hand strokes. 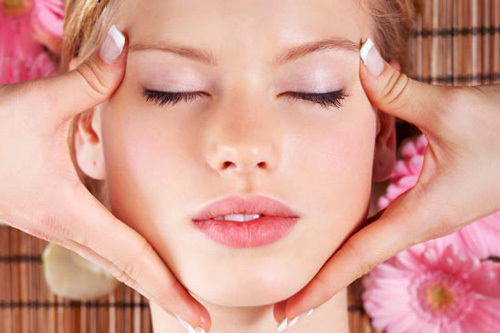 This treatment begins with a divine massage using hard or soft pressure according to your liking. The massage is then followed with sugar body scrub + natural botanicals using authentic organic coconut oil, enriching and nourishing your skin. The coconut body scrub massage is an amazing way to renew your body, leaving it feeling fresh and smooth! This treatment is designed both to relaxing and stimulate the entire body and helping to maintain healthy and fresh skin. It is the perfect alternative to oils and lotion. Your skin will feel soft, smooth and silky without any residue. Collagen & Ginkgo leaf extract helps to create a feeling of well being, and is beneficial for many skin conditions and will make the skin healthy and flexible. Let Siam Balance Thai Massage wind back your body clock to a younger, fresher you! 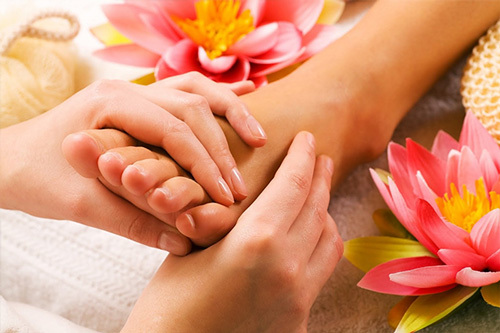 Is an energising massage in which the therapist uses hands, elbows, legs, knees and feet to manipulate the muscles and connective tissue, and work along the major energy channels to revitalise the body and mind. The massage incorporates various techniques such as muscle compression, acupressure and stretching. This combination massage treatment is the one you can enjoy the best of both worlds – East and West. Blending traditional Thai massage, gentle stretching and following long stroke massages with Thai herbal balm & aroma oils on your back and traditional Thai massage on your legs. It is great for sore muscles, inviting the feeling of complete inner calm. Promoting blood circulation in stress zones, this massage is ideal for alleviating general tension, sports related pain and chronic muscle conditions. Foot Reflexology Is the technique of massaging and stimulating the reflex points on the hands and feet. This has a beneficial effect on corresponding parts of the body, stimulating nerve endings, thereby improving blood circulation and nutrient absorption to boost the immune system. Hot Herbal Compression Is a technique of aromatherapy used to reduce minor aches and pains, especially in colder weather, where the pain becomes more severe. Muscles are stimulated by massage before heat is absorbed through the application of a herbal ball. Circulation is increased, relieving ailments. We offer a range of treatments to help you feel and look good. We use quality oils and creams to ensure your skin is left feeling supple and youthful. Take a look through our range of treatments that we offer and we look forward to seeing you soon. 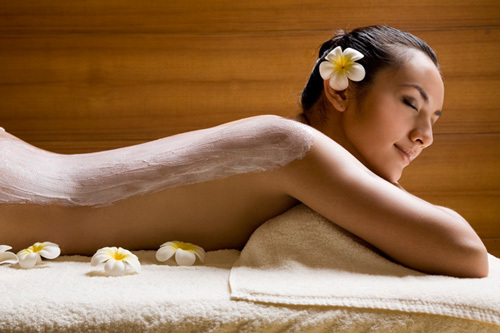 Body Scrub is the gentle exfoliation of the skin that will remove dead cells and promote better blood circulation. After the treatment, the skin feels smoother and brighter. Facials use deep cleansing techniques to promote new skin growth. The treatment will enliven tone and complexion, condition the skin, relax facial muscles, improve circulation, break down fatty deposits, release toxins, reduce wrinkles, and leave the skin feeling smoother and more vibrant. Ear Candles are used to remove the waxy build up and other debris from the ear canal. The treatment can ease or relieve headaches and migraines, sinusitis and congestion, and can help to cure ear infection.